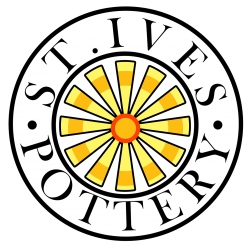 Welcome to St. Ives Pottery. Set inside RAAR Emporium, our ceramic studio is easily accessible in central St. Ives. You can have the experience of throwing on a electric wheel; beginners and skilled people are welcome. Our classes are run by Angela, an experienced ceramicist for more than 20 years. Class sizes are kept small to ensure you receive quality tuition. Sessions range from one-to-one lessons to groups and parties. We have one vintage electric potters wheel and a small area for others to sit and watch/learn. Whatever you create you can take home wet and let it air-dry (1-2 weeks), then paint and varnish at home. Currently the sessions are make and take; we hope to have a kiln later in the year then we will be able to offer more classes. St Ives has been famous for both its art and crafts for many years. Its connection to Bernard Leach and Shoji Hamada, whose studio you can still visit, is well known, and the legacy of Bernard Leach’s time here is modern studio pottery. St. Ives is full of amazing crafts people and galleries. Rather than just experiencing the art you can have a go at making your own! Now you can become a ‘St Ives Artist’ yourself by having a pottery wheel throwing session with us. Like all the best studios it is slightly hidden away inside RAAR Emporium in the creative heart of St Ives. St Ives resident Angela Roberts will help any skill level and age to create a pot on the electric wheel. Angela is a multi-talented crafter and a trained ceramicist. She has been teaching others since she was 18 and loves anything to do with pottery. Now with her own pottery in place she is starting to work on her own creations as well as offering others a wheel throwing experience. Daytime: book a slot or drop-in (please check availability/opening times before making a special journey). Sessions can start anytime between the times indicated below. Evenings: pre-booking required as outside of normal opening times. Sessions can start anytime between the times indicated below. Tuesday – Saturdays: from 5.00pm (start time can be anytime up to 7pm). If for any reason you can not attend any of these times or have a special request please do contact us and we can try to accommodate you. We now have three different workshop options to choose from for people wanting a clay experience. All options are make-and-take sessions where you can take away your pieces once they have dried enough to transport (normally allow 24 hours). Once they have further dried they can be painted and varnished at home if wanted. All the clay is suitable for kiln-firing and can be done by us or others at an extra charge. Pottery Wheel-Throwing Lesson, £35 per person: An introduction to pottery course lasting an hour. For those wanting a more in-depth introduction to pottery wheel-throwing. Our resident potter will give a demonstration first, then give you one-to-one tuition while you create various pieces at a relaxed pace. 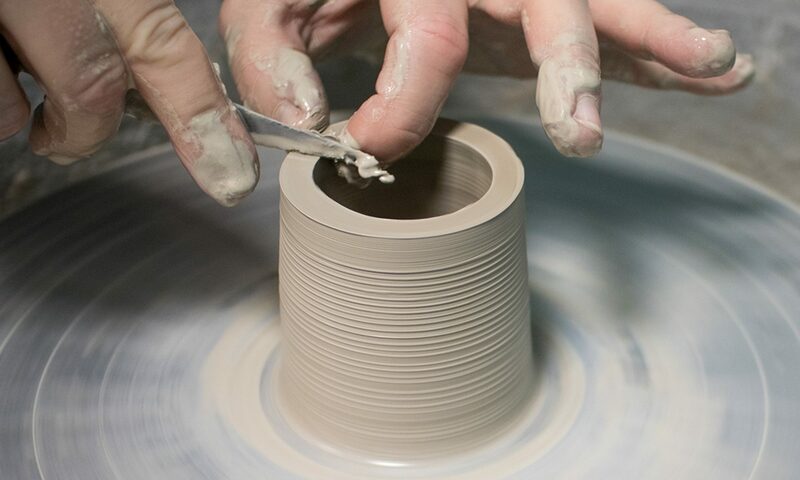 You will learn about the history and processes of wheel-throwing, including wedging the clay, centering and throwing a cylinder, and the background history of pottery (traditional, industrial, studio). We continue by repeat-throwing a cylinder, then creating a piece of studio/art pottery. You can take away 3 pots from this session. Click for more details. Intensive Wheel-Throwing Experience, £45 per person: If you are interested in learning more techniques and being on the wheel for longer, why not book in for a one-to-one lesson lasting an hour and a half. This lesson focuses on practical throwing techniques. You will learn how to make various shapes, be set challenges and make a final project using the skills you have learnt. You can take away 4 pots from this session. Click for more details. Gift Vouchers are available for each of our main workshops which make great gifts. Group Workshops, £15 per person: you can all watch and learn from each other on the wheel or play with clay while you wait your turn. Lots of fun and can get competitive. We currently would recommend small groups of up to 6 people due to the size of our studio. Your taster session can start with a demonstration then each person has a go with instruction from our potter. Please allow approximately 20 minutes per person. Why not get a group of friends together and bring your own drinks and snacks and make it a party?! There are plenty of shops and takeaways around Royal Square for supplies. £15 per person, needs to be booked in advance. £12 per child*: Minimum of 4 children, an adult also needs to be in attendance. If you want to bring your own snacks, cakes etc please let us know beforehand and we will have a table ready for them. You will need to bring your own cutlery, plates, cups if needed. Please try to use reusable ones to help cut down on waste. To book yourself in for a pottery wheel-throwing experience or for further enquiries please use the form below and we will get back to you as soon as we can (when we are not covered in clay!). We are awaiting a kiln to have on site and once it is here ceramics made in the heart of St. Ives will be available.